Only Two Days Left To Register for ICare4Autism’s National Conference – Register Today to Save Your Seat! NEW YORK, NEW YORK, ICARE4AUTISM, October 8, 2018 /EINPresswire.com/ — The ICare4Autism’s National Conference is only two days away. On Wednesday, October 10, ICare4Autism will present a Nationwide Apprentice Training Program for High School Students with Special Abilities in Washington D.C. at the US Capitol Visitor Center, Congressional Auditorium and Atrium. Some of the Conference speakers include: Julian Alvarez III, Commissioner Representing Labor of Texas Workforce; Jennifer Sheehy, Deputy Assistant Secretary (ODEP); acclaimed professor and educator Stephen Shore, Ed.D. Clinical Asst. Professor, R.S. Ammon School of Education at Adelphi University; Robert Naseef, Ph.D. (PA) of Alternative Choices; policy advisor Scott M. Robertson, Ph.D., U.S. Department of Labor (ODEP); Carol M. Schall, Ph.D. Asst. Professor School of Education, Virginia Commonwealth University; David Kearon, Director of Adult Services, Autism Speaks. The national conference will focus on initiating an Apprentice Training Program for High School Students with Special Abilities across all 50 states and what better time to do it than in the month of October dedicated to National Disability Awareness month. Speakers will discuss the importance of including high school students with special abilities in apprenticeship programs prior to entering the workforce. Together we are creating pathways to comprehensive apprentice workforce training programs for our high school students with special abilities. 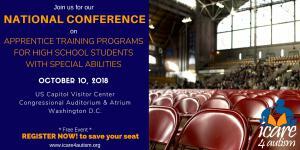 Parents, students, educators, therapists, faculties of surrounding universities and especially organizations and institutes dedicated to serving individuals with special abilities are invited to attend this informative conference that will be a wonderful resource and a wealth of knowledge around the topic of employment for all High School Students with Special Abilities. Registration for the conference is still open and there are still some seats available. Visit the link below to complete your free registration. ICare4Autism’s website is also a wonderful resource for upcoming events, such as conferences, workshops and educational articles on the topic of Autism. Be sure to visit www.icare4autism.org for more information. ICare4Autism serves as the lead global non-profit organization dedicated to improving the life of children and adults who live with autism. Founded in 2004 by Dr. Joshua Weinstein, ICare4Autism has established itself as the catalyst that drives collaborations among similar international institutions to discover the etiology of autism, search for biologic and environmental causes, and ultimately work toward better methods of detection and treatment. We connect researchers and practitioners through renowned conferences and workshops to discuss state-of-the-art findings and innovative treatment practices to best serve people with special abilities and their families.